Linguistic Note: From Latin Iuvenis. The names of the Roman Goddesses Juventas, Juno, and Juturna, are all spelt with a J and pronounced with that sound (fopho J as in jaw) even though it is well known that the Roman's did not recognise or use this sound. Description: Goddess of increase, blessings and youth; She Who represents the eternal youth of the species and its solidarity; She Who has the power to renew the youth of the aged. Juventas was later replaced by the male Jove, Youth. Variant, and more accurate representation of Her name Iuventas, YWV]T1S. 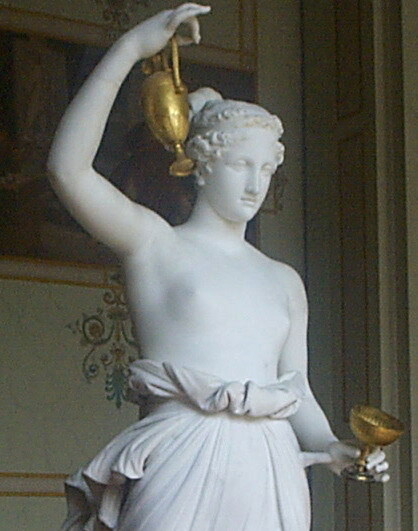 As Hebe, Downy-One, (below), is the maiden form of Hera, so Juventas is probably the maiden form of Juno. Alternate meanings: Youth, She-Who-Removes-from-Sight, Virgin-Mother-Earth. Linguistic Note: Greek roughbreath-eta-beta-eta, youthful strength, vigour; metaphorically, youthful cheerfulness, or youthful passion, fire, spirit. Related English words: hebephrenia, hebephrenic. Perhaps hebetude, if the Romans took their hebes, hebet-, dull, from the Greek youth. Description: Goddess of spring and the fresh young shoots of vegetal growth; the unfolding bud; She Who represents the moment of transition between youth and maturity; Cup-bearer to the Deities; Renewer of immortal youth; Harnesser of Hera's horses; Protectress of childhood and virginity. To Whom Sacred: ivy; eagle; ambrosia; nectar. Festival: Kissotomoi, The days of ivy-cutting. Male Associates: consort, Heracles; sons, Alexiares and Anicetus. In the sense of the blossoming of youth She is also called Antheia, Flowery-one. She is also called Dia, Of-the-Day, Who is linked with Dione. Her name may be etymologically related to Eve, Mother-of-all-Living. She is known also as Ganymeda, Rejoicing-in-virility. One of Her companions is Harmonia, Concord-of-sounds, Who is linked with Concordia, Synthesis-of-Minds. Perhaps She originated as Anatolian Hepat, Earth-Mother. She is the Daughter of Hera, Our-Lady. The terms Mother and Daughter with reference to Goddesses, often mean older or younger aspects of the same concept. She was called Juventas, Youthfulness, by the Romans. As the first person of the Triple Hera in Arcadia, She is called Pais, Child'. She is also called Parthenia, Maiden, below. Source: EB Hebe; Graves GMv1 203; IGEL/347. Hebe's alternate name of Parthenia, Maiden, appears to be a variant of Parthenos. The Maiden aspect of Hera, Our-Lady, in the Stymphalus Triad is called Parthenos. worked on: December, June 1995; August 1991.